Holiday Crafts for a few bucks......Heck, yes! This is our last week of the Homemade in December party and we are featuring dollar store crafts - crafts made with products from the dollar store. To kick off this week, we have Emmy of Emmy Mom - One Day at a Time. Emmy is a creative mom of 3 and an awesome photographer and she is one crafty mom too. 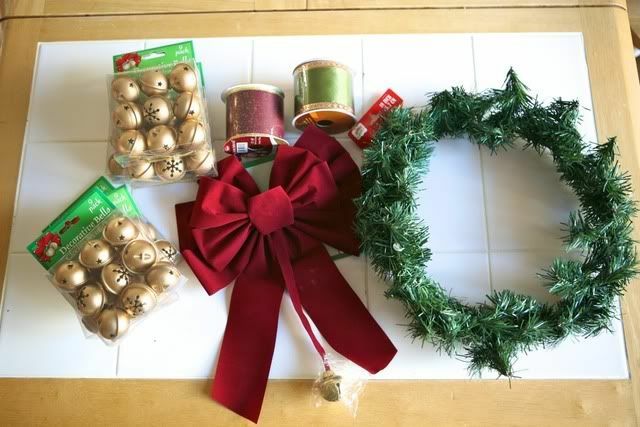 The Dollar store can be a hidden gem at times- and today's project a Christmas Bell Wreath was created from things only from the Dollar Store. You can make one easily too and for only $7! String the cords that come with the bells through each bell. 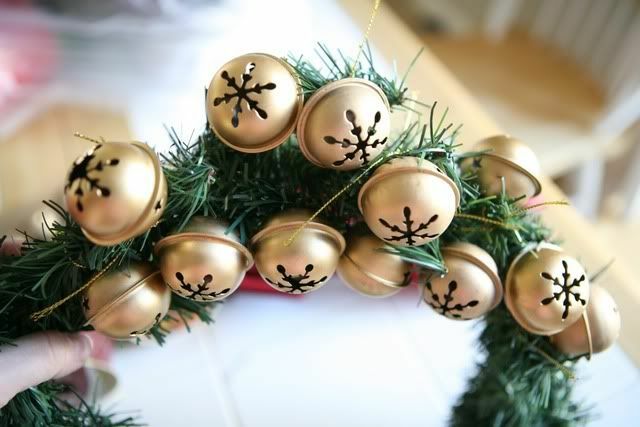 Then simply tie each bell onto the wreath. Make sure the knots are tight. You can tie the bells to the front and on the front sides of the wreath- leave a few extra to go back and fill in any holes at the end. 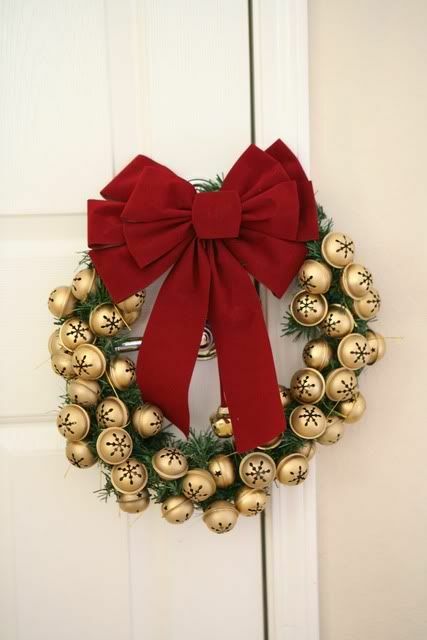 Place your bow at the top of the wreath to see where the bow covers the wreath as you DO NOT need to place any bells there. Secure the bow to the wreath with the twisty tie that came with the bow. 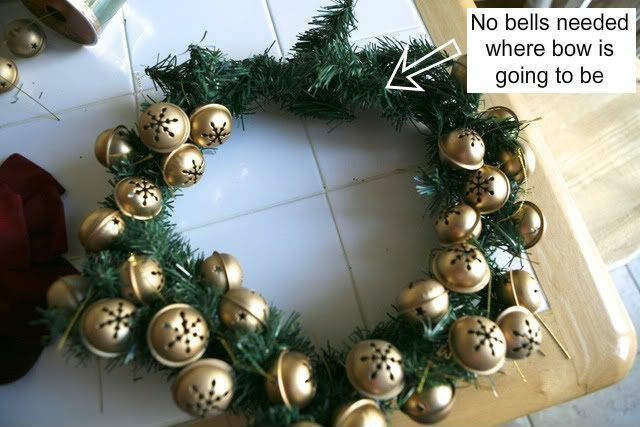 Hang the wreath (I just put on a door knob) to see if there are any spots you want to go back and add any more bells. 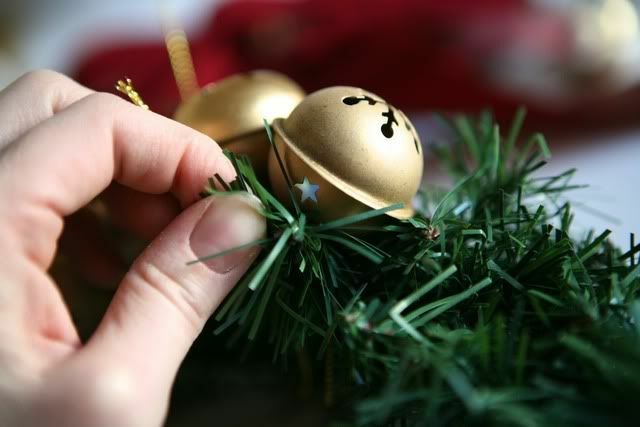 Take scissors and trim any of the gold strings showing. 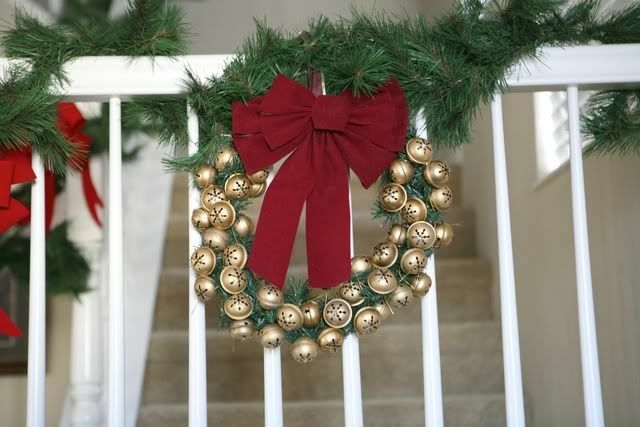 Easy, fast and low cost for a great bell wreath. This is so pretty! I love the way it turned out! I will have to look for bells at my dollar store. Love this....I love making my own wreaths (so much cheaper than buying them) and this one is not only affordable but super cute as well. Thanks for sharing on my blog Emmy!! I have yet to make my own wreath, but I have aspirations to. I love that it's affordable to make and easy enough for me! Great tutorial! So cute and super easy! I love it! Was this found on Pinterest? I haven't been on lately? NO matter where or how you came up with it, it is beautiful and if you bought it at Micheal's it would cost $30 bucks or more! Great job! That's so super easy - great tutorial! No this wasn't on Pintrest- Charlene asked if I would do a dollar store craft- do I went to the dollar store with no idea what I was going to do. I started seeing different supplies and the balls started rolling- so to speak. Love it. I'm about ready for a new one.